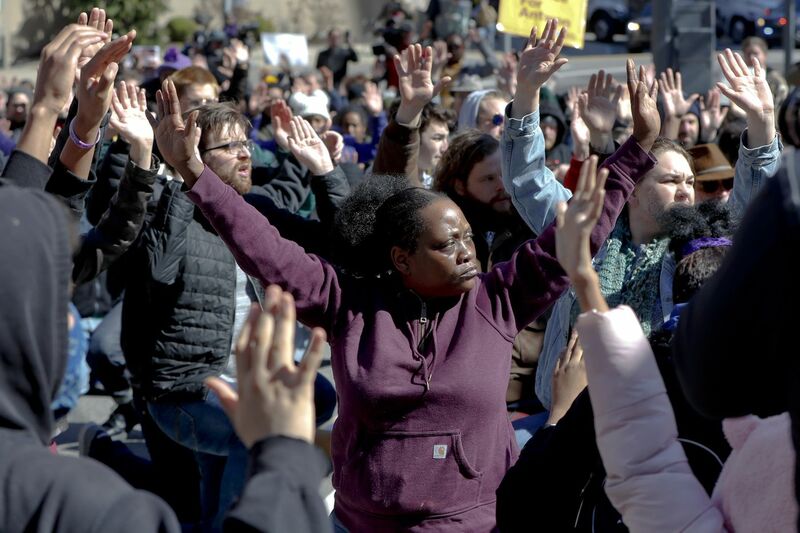 Marchers stop and sit with their hands up in an intersection in the streets in Pittsburgh Saturday during a protest. At noon on Monday, high school and college students across Pittsburgh are expected to gather at the City-County Building in downtown for a rally protesting the acquittal of Michael Rosfeld in the killing of Antwon Rose II. Organizers are stressing to participants that the rally remain peaceful. Students at Pittsburgh Public Schools must have permission from their parents to participate in the walkouts and follow the district’s early dismissal procedures, superintendent Anthony Hamlet said over the weekend. The district will make support available for any “difficult conversation that may arise with students as a result of the outcome of the jury’s decision,” he added.